The Serpentine dresser was finished quite awhile ago. I cleaned out my garage (where it lived while I was refinishing it) and was able to park the car in there (which lasted until I pulled out all the Christmas decorations). Since the Serpentine Dresser has 9 drawers I wanted to utilized the space really well (I’m really geeky like that). I envisioned that it would be able to house my dainties just like you see at Victoria Secrets. And now the vision has come to fruition! No more crammed lingerie. No more socks tangled with the bathing suites. Everything has it’s own place. Here’s the final image of the dresser in my tiny bedroom. 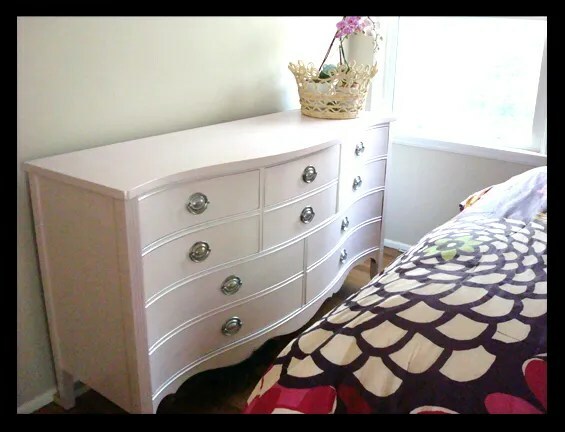 The dresser works so much better since its around the same height of my bed. It’s a large piece yet it doesn’t overwhelm the tiny space. The drawers glide smoothly, everything is accessible and I’m loving, loving, loving it! Oh I love me some curb collecting…. and they leave out the best stuff in my hood. They know the curb fairies soon will come by and magically remove it from the curb. It’s a little embarrassing…. oh hell, no, it’s not. I’ve curb collected some really great stuff. This adorable vintage patio bistro set for example! And no, it didn’t look like this to begin with…. (Sorry, no before picture). Its paint was chipped and worn, and the table top was missing the glass. I’ve always wanted a little vintage set like this and it’s the perfect size for my little yard. I had it sandblasted and powder coated a new clean white. The seats were recovered with a trendy black and white outdoor fabric in a coral print. Here are the steps involved- pretty standard chair covering techniques. Remove the old fabric – always an adventure, you never know what you’ll find. This time the boards were a little musty and had to be replaced. I got some outdoor resistant plywood and traced the old boards onto them. Then I cut them out and sanded them down. You’ll thank me later when you place the boards back on the chair and mark where the screw holes go. I used a small bit and I pre-drilled the holes to make mounting the screws easier. It’s a good idea to mark where the back or the front goes. Use the new boards to trace the pattern on new foam for the seat cushions. This is where investing (and by investing I mean dig through the kitchen stuff at your favorite thrift store) in an electric knife is going to make this job a cinch. (Your mom might have one in her drawer that she doesn’t use anymore….) Cut out the foam with your handy dandy new electric knife (this is fun). Layer the board, the foam, a thin sheet of quilting batting and lastly your fabric. Staple the fabric to the board in standard upholstery method. Pick one side, staple, then immediately staple across at the other side, pulling the fabric taunt. (Think North, then South) Be sure to keep the holes that you pre-drilled clear or you’ll be cussing later. Next staple East then West, again pulling the fabric taunt. Start filling in between, again stapling across from one another. Fold gathers into the fabric to make it look neat. Trim away the fabric from your staple job. You can add a circle of fabric to cover up your staple job (glue it on if you must) but I live under the assumptions that people aren’t picking up my chairs and looking underneath them. That being said, the chair backs were viewable from the back, so I traced the chair back board directly onto a piece of the same fabric. Then I trimmed it about 1/2 smaller and glued it on the back to cover the board. 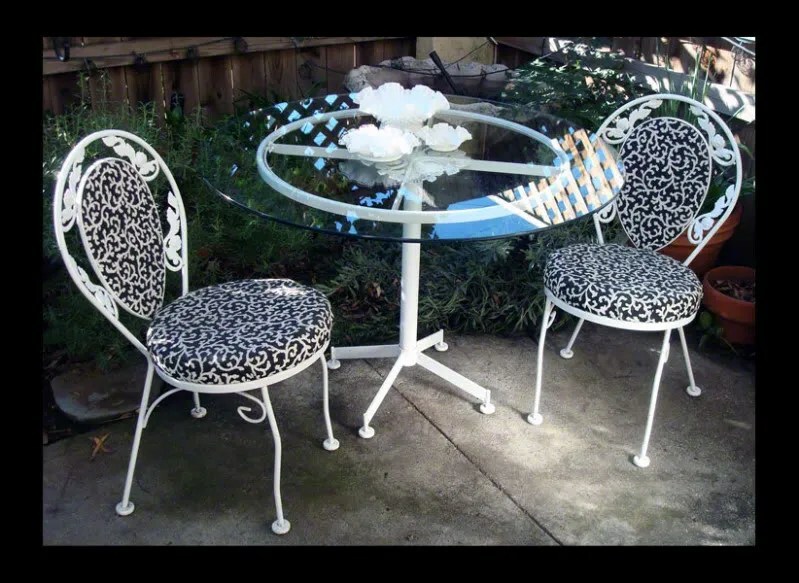 Screw the pieces back onto your chair frames, brew yourself a fabulous latte and enjoy al fresco Dining at its best!